NSA | COURAGE FOR AMERICA! 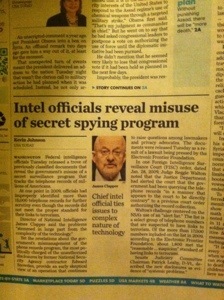 What does James Clapper have to say? Today’s shooting rampage at the Washington Navy Yard is another example of the disconnect between what the NSA claims it is accomplishing from its headquarters– and the reality on the ground. In spite of the massive dragnet of communication records, our national intelligence officials were not able to stop the massacre in Boston– nor today’s massacre at the Washington Naval yard. James Clapper, Director of National Intelligence, has some explaining to do. Is the “complexity of the technology” too much for the NSA to handle?